Any way to do curved text without manually placing it on the drawing? What I would like to do is to place the characters 01234567890 in a circle all precisely paced apart at a distance or angle that I specify . 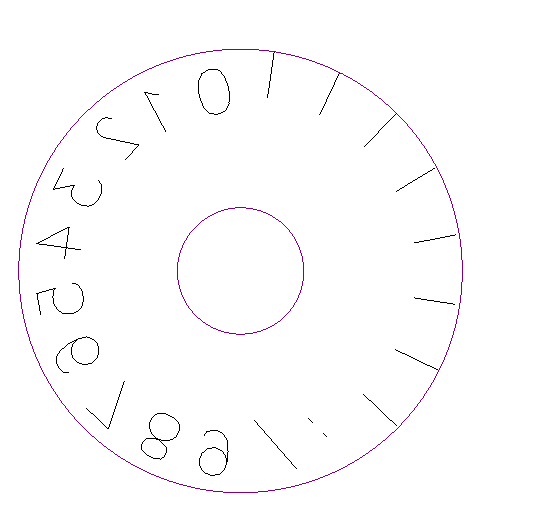 This is not a typical CAD feature and there is no 'curved text' tool in LibreCAD. You can do it step by step, letter by letter. Or you can use DTP software like inkscape. Curved text shouldn't be a problem in inkscape and you can export to DXF format. But, I haven't tried that yet, no practical experience. While there is no direct way to add curved text in LibreCAD, your CNC machine might have the ability to do so. I work with a Milltronics CNC and it does have that ability. I don't know if all machines do or not. It was a bit tedious but I was able to do it in LibreCAD. I created a geometry to segment the circle then placed the numbers. LibreCAD doesn't have some of the sophisticated mathematical solutions built in like some of the expensive proprietary software but, with a bit of geometry and drafting knowledge, there is usually a workaround: even if it can be a little slow and tedious at times.